The severity of injuries sustained in a rear-end car accident depends on the momentum created by the force of the collision. The momentum of a vehicle, in turn, depends on the weight of the vehicle or the speed at which it was traveling prior to the collision. 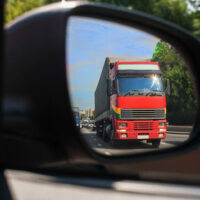 For this reason, some of the worst rear-end accidents involve semi-trucks and other commercial vehicles, which can weigh upwards of 80,000 pounds and often travel at high speeds on the freeway. When these types of accidents occur, the damage caused is usually much greater than that caused by smaller, lighter vehicles, leaving victims to suffer through painful and expensive treatments. Injured parties should not also have to worry about how they will pay their bills, especially if they weren’t at fault for their accident, so if you were injured when you were rear-ended by a large truck, it is critical to speak with an experienced truck accident lawyer who can help you seek compensation for your losses. The truck carries non-hazardous property across state lines. However, if a truck transports hazardous materials, it must carry even more liability insurance. In fact, even trucks that weigh less than 10,000 pounds, but still travel across state lines, and carry gases, radioactive materials, or explosives must come with $5 million of liability insurance. Unfortunately, not all trucking companies purchase the correct amount of insurance and in some severe cases, accident damages will far exceed liability coverage. This is especially true with rear-end accidents involving semi-trucks, as these kinds of collisions usually cause multi-car pile-ups. Rear-end accidents are dangerous enough on their own, but these types of collisions pose an additional risk to other drivers because they often lead to override or underride accidents, which occur because the clearance on a truck is actually high enough that certain cars can fit underneath it. If a truck rear ends a smaller car, the truck’s momentum could actually cause its bumper to ride over the back of the smaller vehicle, potentially crushing the occupants, in what is referred to as an override crash. Underride accidents, on the other hand, occur when a car rear ends a large truck and slides beneath the trailer itself. Although special underride guards are intended to prevent this from happening, they are not always effective, which can have devastating consequences for a vehicle’s occupants. If you or a loved one were involved in a rear-end collision with a large commercial truck, please contact a member of the legal team at Boone & Davis to schedule a free consultation with a dedicated and compassionate Fort Lauderdale truck accident lawyer. Please call 954-566-9919 today.